Academia Tica has two campuses. Both are situated in classic, well-maintained houses, surrounded by beautiful gardens and staffed by teachers trained in Instituto Cervantes methodology. But beyond the school walls, Jacó and Coronado as are different from each other as the beach is from the mountains. Coronado refers to a canton or county, half a dozen neighborhoods and villages that climb up the hills outside of Costa Rica’s capital city. It is literally in the middle of the country, equal distance from the Caribbean and Pacific coasts, from Panama and Nicaragua. Eons ago these temperate highlands were formed by volcanic eruptions. Today part of the forests have been cut into pasture, producing food and dairy products for the valley below, a metropolitan area of 1.8 million people, nearly half the country’s total population. The church is at the heart of Coronado, a short walk from the school. With a geography that relates as much to cloud forests as urban plazas, and a cultural identity linked to cattle ranching, Coronado is a mixing point. Parts of it look like country scenes: herds grazing emerald seas, grandmas selling cheese off front porches, families with backyard trout ponds serving up the freshest fish imaginable. Yet, there are unmistakable signs that for thousands of commuters, city life begins here. Walled modern homes abut cow pastures. People brunch and work on their laptops at a gourmet bakery and coffee bar. A family-run soda sells typical “casado” plates: heaps of rice, beans, sweet plantains and salad for about $2.50 USD; while the menu and prices at nearby Papa John’s Pizza chain could be anywhere in the world. 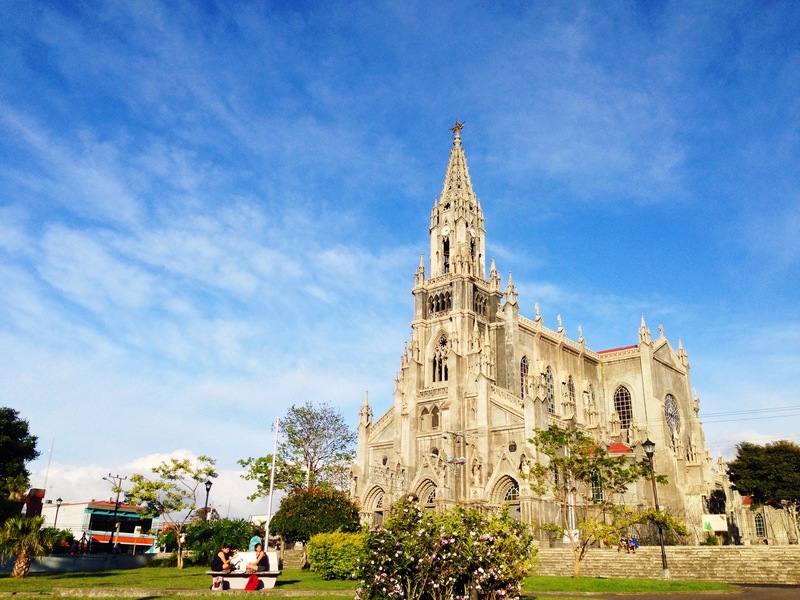 In the town’s busy center, life revolves around an impressive neo-Gothic-style Catholic Church. 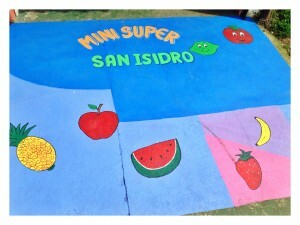 Hand painted sign for a fresh fruit and vegetable super near the Coronado school. 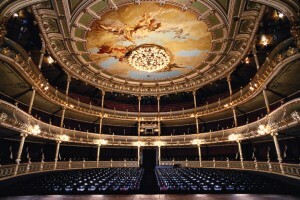 The National Theatre is one of many cultural meccas close to Coronado. The bus costs about 60 U.S. cents. It can take you in two general directions: up or downhill. Up heads towards Las Nubes, a village appropriately named The Clouds, known for cool climate, incredible views and agriculture. Here you can go horseback riding, catch your own lunch or visit a pristine cloud forest. Further up is Cascajal and Monserrat, the latter immersed in the dense cloudforests that limit with Braulio Carrillo National Park. 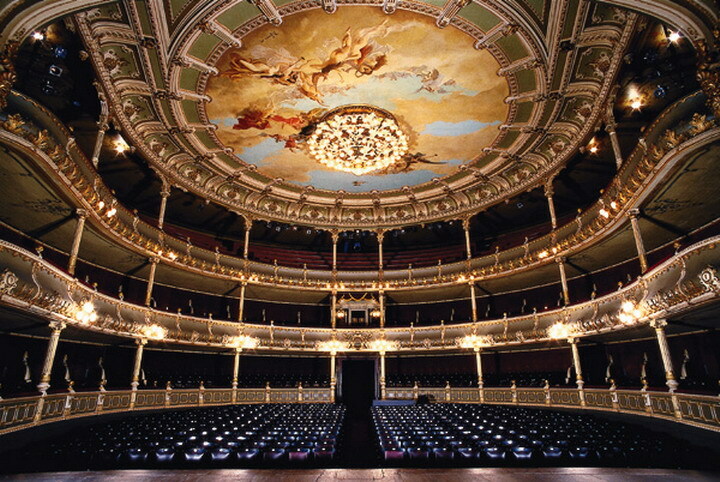 Down leads to central San José, epicenter of urban culture and government, where dozens of theaters, busy markets and museums await. Because Coronado is relatively unchanged by foreign tourism, ordinary stuff like buying food, going out for coffee, getting a haircut and practicing common courtesy are all part of everyday life and your Spanish language education. Buy fresh fruits and veggies every week at a farmer’s market that brings producers from all over the region, or pick up your goods at a small shop down the street with a charming hand-painted sign. 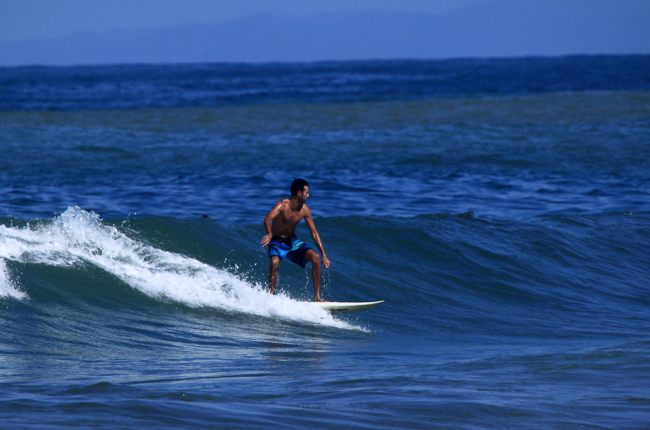 Jacó is the nearest popular beach to San José and an easy morning drive from Coronado. The 2.5 mile long sandy beach break offers consistent swell year round, with bigger waves to the North and smaller, beginner-friendly waves to the South. Tethered to this famous beach are innumerable restaurants, hotels and bars, along with hospitals, major stores and most any amenity one could look for. Many students customize their schedule with Academia Tica to include stays at both Coronado and Jacó Beach. A few generations ago, Jacó was home to a few dozen families, rice fields and roving cattle herds. People tumbled in and out by rock road, taking a ferry across the crocodile-infested Rio Grande de Tárcoles to access distant hospitals or go to the movies in bigger towns to the Northeast. By the mid-20th century people here began to rent palm-roofed cabañas to visitors from the Central Valley and abroad. Today Jacó is book-ended by luxury resorts, a smooth highway delivering visitors from all over the world. People come for the beach, the party scene and the wild places still a stone’s throw from this rapidly developed hub for Pacific Coast tourism. Enjoying the warm water and friendly waves in Jacó Beach. One of many colorful characters in Jacó. Just 25km/15 miles North of Jacó you’ll find Carara National Park, a protected tropical rainforest, which has one of the biggest wild populations of colorful scarlet macaws. It is not just a heaven for bird lovers. The park is home to some of the country’s largest American crocodiles, sloths relaxing high up in the trees, different monkeys, frogs and birds. One of the country’s most famous (and smallest) parks, Manuel Antonio, is located about 65 km/40 miles South of Playa Jacó. 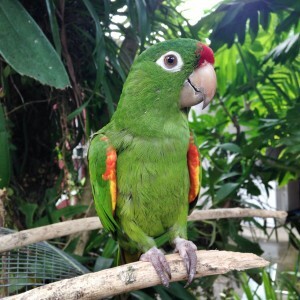 Exploring the lush green rainforest and remote beaches on the many trails, you will easily spot mammals like lazy sloths and cute squirrel monkeys as well as frogs, iguanas and many kinds of birds. Jacó Beach has consistent waves for all levels year-round. Jacó Beach is not only surf. Close to the town (and the school) you can go zip-lining, take a dip in watefall ponds, enjoy the nightlife, go rafting or just sit back, relax and enjoy a cold drink in the tropical setting. Academia Tica recommends that you try a bit of both locations and experience all the differences in culture, people, nature and just the general town dynamic. This will defninetively help you get a more integral view of what Costa Rica is, always with the same quality of Spanish tuition!